General Description: The Merrimack stemmed point type has a narrow trianguloid blade shape with slightly convex blade edges while straight blade edges are rare. 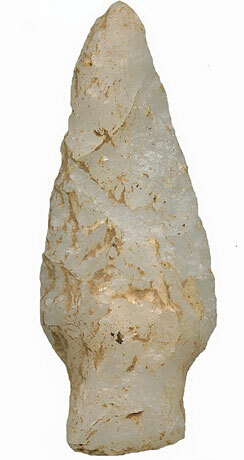 The Merrimack was a dart point. The shoulders in most specimens are neatly executed but are small and can be well defined or rounded and often angle away from the base. Some rare examples approach the stem at right angles. The stems are long, wide and well thinned and have parallel sides on 72% of the specimens and slightly expanded stems on 18% of the specimens or slightly contracting stems on 10% of the specimens. The base of the stem is most often straight or slightly convex but never concave. Stem grinding is most often present. The Merrimack point type is the last of the Neville complex of point types. The size of the Merrimack point ranges from 25 mm to 65 mm in length. The average size for the point is in the 40 mm range. The Merrimack type is typically made from local materials principally cherts, quartz, and quartzite as well as fine grained igneous rocks. The Merrimack can be found in Massachusetts, all of southern New England into Vermont and New Hampshire, Connecticut and down into southern New York, northern New Jersey and eastern Pennsylvania. The Merrimack type was named by Dena Dincauze in 1976 for points found at the Neville site in Amoskeg, at the Merrimack River, Manchester, New Hampshire. NOTE: Merrimack points that have been resharpened will result in specimens with shorter and narrower blades than they had when they were in as new condition. The shoulders on these resharpened specimens will be greatly diminished in size. 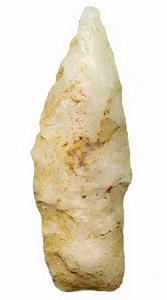 Perino notes that it is very possible to mistake a worn out Neville point for a Merrimack point. Snow reports that the Merrimack type has a limited or restricted distribution area, primarily around the Merrimack river drainage according to Dincauze and Mulholland (1977), perhaps attributed to some intensified regionalism of the point or due to some climatic fluctuation or event that took place around 6000 B.P.